The koi, or Japanese carp, is a powerful symbol in Asian cultures and a popular choice for elaborate and impressive tattoos. Make a splash with leaping, life-affirming koi ink anywhere from your arm to your ankle. The names koi and carp are interchangeable and reveal the history of the beautiful fish. Over a thousand years ago, the Chinese began breeding Prussian carp, a large, freshwater edible fish, for color and other unusual characteristics. By the 1800s, koi - from the Japanese word nishikigoi or "colored carp" - were the rage in Japan. The Asian love affair with carp spawned a school of legends that give its image a rich symbology. The natural grace of the koi and its attached significance are tailor-made for tattoos. Koi ink is both art and statement on your skin. During the Tang dynasty (618-907 AD), a mutation in ornamental pond carp produced a yellow-orange variety from the silvery fish. Since yellow was the exclusive imperial color and oranges symbolized wealth, the golden-orange carp were forbidden to anyone outside the royal palaces. The aura of good fortune and privilege is as firmly attached to the fish image today. Koi is also a homophone for the Japanese word for love. So, your koi/carp tattoo evokes the blessing of good fortune and the joy of great love. In the Chinese art of feng shui, koi are credited with bringing luck, wealth and a happy marriage. 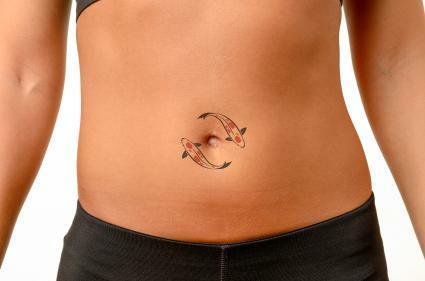 Auspicious placement for your luck and love koi might be centered over the chest or covering your side over the ribs. One of the most compelling Chinese legends about the carp is the tale of fish in the Yellow River. A great school of thousands of carp was swimming upriver, pushing the current before it. The strongest fish persevered against the river's flow until they reached a mighty waterfall. For a hundred years, the bravest of these fish tried to leap over the falls until at last one succeeded. The gods rewarded the courageous carp by turning it into a magnificent golden dragon, and ever after the falls was known as Dragon's Gate. A carp transfiguring into a dragon makes a breathtaking full-back, forearm or thigh tattoo that signifies independent spirit, unstoppable determination and courage. Japanese koi colors have their own names and meanings. Gold, Yamabuki, stands for prosperity, treasure and good fortune. Kohoku, white koi with a red mark on the head, means career success. Kuchibeni, a white koi with distinctive red markings around the mouth that look like lipstick, is the symbol for an enduring love relationship. Black koi, Komonryu, forecast life changes and mimic the Japanese dragon of transformation. The silvery-gold platinum-colored koi, Ogon, means business success; this might involve an enterprise or investments. Popular tradition links artificial koi colors with gender roles - blue for strong masculine and pink for delicate feminine traits. 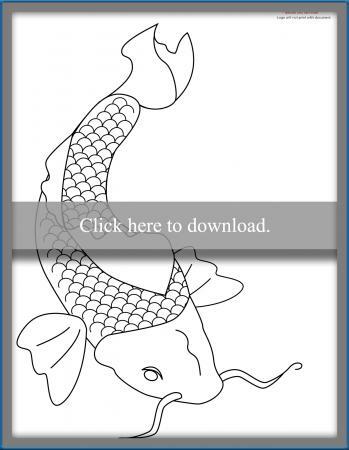 Use color sparingly for a small koi on a wrist or encircling a navel. Go all-out for a cinematic koi-centered scene that's a full-sleeve or shoulder and upper back. A lone koi swimming up your calf is an eye-catching and intrepid statement. Add a background to that image and you alter and enrich the meaning. Whether your koi graces your shoulder, back, leg or chest, a fish entwined with a lotus blossom broadcasts both purity and successful struggle. The exquisite lotus grows from its roots in the mud and the koi persists in swimming against the current to reach its goal. Cherry blossoms signify femininity and fertility but fallen cherry blossoms are symbols for a fallen warrior, a samurai bravely facing adversity. Double koi is the yin-yang of the dance of life and means harmony. Two koi may also symbolize your birth sign, Pisces, the ability to go with the flow in life. Fish made of ink are potent icons of bravery, unconventional personalities, nobility, worldly success, epic love, tenacity and fearlessness. Even the tiniest black line drawing of a koi on a finger or behind your ear, is a detailed lure to capture attention and inspire curiosity. The koi belongs to an ancient narrative of heroism and sacred myth. 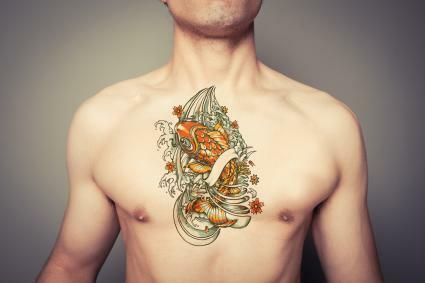 Koi ink signals that your story is more than skin-deep.